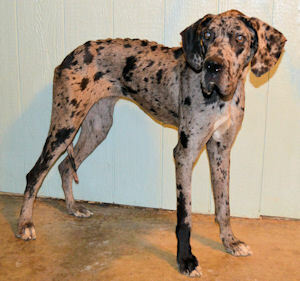 ADOPTED: I have found my forever home!! I have a wonderful new mommy and she is the bestest!! It was love at first sight!!! You can see the love in mommy's eyes!! I was dumped like yesterdays garbage, to fend for myself last fall in Stark County. As you can tell I did not do a very good job of finding food! I was so terrified that I would not let anyone catch me until one day the Stark County Dog Wardens caught me and took me to their shelter. Heck had I realized how nice these people were I would have ran to them!! No one can believe that I actually survived this winter without proper shelter and food! Once my stray time was up they called Harlequin Haven to come for me and well here I am!! 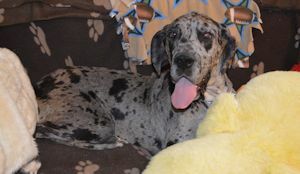 I now have a soft bed, tons of toys, lots of hugs and kisses and best of all lots of dog food!! I am being fed small amounts every few hours so I do not make myself sick!! I weigh 69 pounds so I have lots of weight to gain and eating to do!! Update: Palmer and I have only been here 2 weeks and we both have gained weight! I have gained 18 pounds!!! Update: It is hard to believe that in just 1 month how much my life has changed. 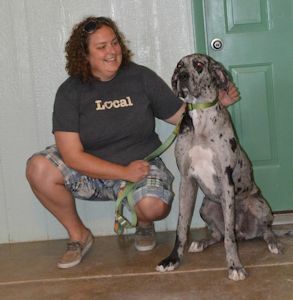 I went from a scared and starving Dane that was roaming the roads scavenging for food to a happy well adjusted young lady! Check out my new pictures! Update: Great News I am NOW ready for adoption!! 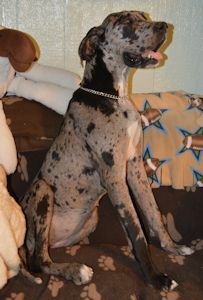 I am a very happy and playful Dane and I am looking for a loving forever home that will give me the love I so deserve!